Who is disbeliever according to Bible? Answer: Zechariah 14:9 The LORD will be king over the whole earth. On that day there will be one LORD, and his name the only name. There will be no ideologies idol worships or gods, but the Almigthy God Alone! Malachi 3:6 “I the LORD do not change. So you, the descendants of Jacob, are not destroyed. Isaiah 43:10 “You are my witnesses,” declares the LORD, “and my servant whom I have chosen, so that you may know and believe me and understand that I am he. Before me no god was formed, nor will there be one after me. Isaiah 42:8 “I am the LORD; that is my name! I will not yield my glory to another or my praise to idols. Hear, O Israel: The LORD our God, the LORD is one. for dominion belongs to the LORD and he rules over the nations. For God is the King of all the earth; sing to him a psalm of praise. 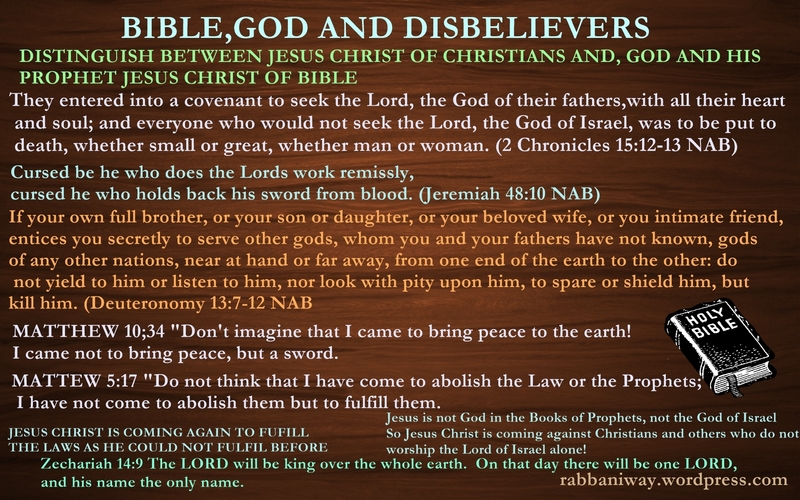 Bible against disbelieversJihad verses in BibleMessiah comingReturn of the ChristWhat will Jesus Christ do when he come back?